We’d love your help. Let us know what’s wrong with this preview of Two Are Better by Tim Bishop. With no prior experience in either bicycle touring or marriage, 52-year-olds Tim and Debbie Bishop went from an engagement, to Tim’s “retirement” and relocation, to a cross-country trek in just ten weeks. Their adventure, which touches on midlife change, marriage, and faith, inspires its readers to cast away the old and the stale in pursuit of their dreams. To ask other readers questions about Two Are Better, please sign up. To start things off, I should say that I won this as a First Reads Giveaway. When I first started reading the book, I was a little intimidated by the religious presence. I wouldn't consider myself to be Christian in the traditional sense so Tim and Debbie Bishop's frequent references to God and faith were things that I felt may be distracting from the plot. As I read on though, I realized that this wasn't the case and, religious or not, their story was a fascinating one that deserved to be told. T To start things off, I should say that I won this as a First Reads Giveaway. The spontaneous nature of the trip and the detailed conversation regarding the good and bad components makes this book a must read for anyone considering a trip like this. The face difficulties: interpersonal fights, exhaustion, doubt, trouble finding lodging, etc. But they overcome them, making the book an inspirational read. Tim and Debbie Bishop are brave. They asked me to read and review Two Are Better, and I agreed, not realizing what an adventure I’d been given. My first shock was learning that the Bishops were my age when they undertook first-time marriage, followed by a cross-country bike trip for a honeymoon. My second shock was thinking, I wonder if I passed them, because some of the same roads they traveled out west were the same ones my husband and I took from the safety of our car, about the same time. We pass cyclists and shake our heads. This book is not simply a travelogue, but a reflection on undertaking a life-transforming journey at what most people consider middle age. Changing one’s entire lifestyle by marriage is one thing, but then to go on a trip for which they both declared they were unprepared immediately thereafter is an interesting throw-you-in-the-deep-end method of learning to swim. The Bishops were honest about the trip and their feelings, and the events, throughout the trip. This is a great book for couples at any stage of their relationship, whether or not you’re planning an adventure. The Bishops are also working on a tutorial book about bicycle touring. I loved the faith of these two souls. Tim and Debbie find each other and end up marrying at age 52. Just how they were put in the path of one another, warms my heart. Once they are married they embark on an unusual honeymoon. They fly to Oregon and begin a bicycle trip across the USA. They seem to be put in the right place at the right time to witness to others. The book is chocked full of beautiful, and breathtaking photos. We sure are blessed to live here. Come along and share the ride and even I loved the faith of these two souls. Tim and Debbie find each other and end up marrying at age 52. Just how they were put in the path of one another, warms my heart. Come along and share the ride and events that happen along their trip. Some are very unusual, and there are a few chuckles too. Most of the story seems to be written by Tim, but there are reports by Debbie...enjoy two different perspectives of the same event! A enjoyed this fast read, and lingered over the pictures of this wonderful, and eventful trip. I absolutely loved this memoir. Inspirational in a real way! This couple , after each almost write off the idea of finding "the one", meet online and begin with a long distance relationship. They have a short engagement and for their honeymoon decide to travel across the country coast to coast on their bicycles. Through trials and sometimes painful (saddlesores) near medical emergencies they begin their married life in a most extraordinary way. Through their shared love of the Lord and their gre I absolutely loved this memoir. Inspirational in a real way! This couple , after each almost write off the idea of finding "the one", meet online and begin with a long distance relationship. They have a short engagement and for their honeymoon decide to travel across the country coast to coast on their bicycles. Through trials and sometimes painful (saddlesores) near medical emergencies they begin their married life in a most extraordinary way. Through their shared love of the Lord and their great determination their story is one of inspiration, love and life. The Bishops tell the story of their bike ride across the United States in roughly two months. I enjoyed how they told their personal story along with the bike ride. The Bishops were newlyweds at age 52 taking their honeymoon to do some real bonding. You really felt like you knew them after reading their story. I love how they shared their faith throughout the story. They even went through some of Iowa which hit home. Give it a read and then go I won this book through GoodReads First Read program. Creating a life with another person requires more than just a physical relationship. In order to decide whether a person really is your soul mate or the person you want to spend your life with requires planning, getting to know the person and definitely understanding their point of view in many areas. Tim and Debbie Bishop took the long route to taking that final step. Both enjoying many relationships but neither finding that right blend or combination to complete either one they decided to venture in a world of online dating hoping to find the right person. Their journey into what Tim calls Cyberspace proved to be not only interesting but in this case a viable and safe way to for each one to meet some with the same Christian values, outdoor interests and even seeking the same end result hopefully a serious relationship. But, neither was too quick to move ahead a lions pace so they took it one step at a time. Hearing each one tell the story about how they met, their time together, their bike rides, their trips, discussions and seven year courtship you realize just how long it took them to finally bond but how special their relationship would be when they would finally join as one. Debbie at one point realizes that she would like Tim to finally make a move and commit. Tim was debating his future at work and whether it was time to make some real changes in his life. As you read the first chapters you will get to understand the huge responsibilities he faces everyday, the reasons he took so long to make up his mind to retire and the changes within his company that helped to solder his decision to leave. Restructuring in a company can often mean some huge changes are taking place. In this case two of his senior level executives were retiring early, his role in the company did not seem as great at is was before Tim realized that it was time to leave. So, April 30, 2010 was his last day of work. But, although he shared this information with Debbie she wanted more from Tim. Not thinking she understood his personal crisis as he puts it he did not understand that after so many years she wanted him to decide about them. Describing what happens next and hearing Debbie’s innermost thoughts you being to wonder why it took him so long. Taking a break from each other allowed Tim to assess his feeling and realize that maybe he might lose the best person that ever came into his life. Everything in life is not perfect and it is during those difficult times that you need someone in your life for love and support. God was not going to figure out his life. God was answering both of their prayers now if they would both pay attention. Then miracles do happen on April 22, 2010 they went up to Acadia National Park and he finally popped the question. At his retirement luncheon he announced their secret and his family was thrilled. Next the bridal shower, the big day planned and the final preparations for their cross-country trip by bike are discussed in detail in Chapter three. On page 25 we see Debbie getting their bike gear together as each one relates their feelings, their fitness goals and Debbie in pink relates how her school year was winding down, how Tim would lead the planning for the wedding and the trip while she completed the school year and its requirements. Two health conscious soon to be married adults were going to go on a cross-country route that might be span as much as 4000 miles to be completed by the time Debbie returns to work in September. With colorful pictures, exciting details and definitely some tense moments before and during the trip Tim and Debbie prove that Two Are Better including many important life lessons and definitely great advice for everyone. They both belong the HopeLine- a service for difficult teens and young adults that brought them closer from the start. Focusing on teens and young adults that need some form of support and intervention while going through the many changes they encounter as they reach adulthood. The preparations getting in place as you see Tim and his friend Jim working together on page 31 to set up the pannier locking system the journey is about to begin. So, all of you adventurous people that would like to take this tour with Tim and Debbie and enjoy the scenery and the ride get your bike gear ready, helmets in place, knee pads too, proper riding outfit and let’s being our journey. Plotting the course out of town and ready for action we hear Debbie’s voice stating that she never realized that now she and Tim would venture out together in the wild and their first stop well it happens people was in search of a restroom. But, not knowing where you would find them you guessed it some of these stops were in the most unusual places. The first day they went 47 miles and don’t say a word that is more than most could do and thinking it would take 80 days without any rest days they did great. Throughout the journey you will see them both wearing the Hopeline T-shirts promoting the organization along with enjoying their trip. The lessons you will learn, the advice you will get, and the thrill of the cross-country biking adventure all come together to form a well written, engaging, exciting book that will appeal to almost anyone. Along the way they went to many different churches and gave out cards for the organization hoping to help other teens. Their next concern was how to handle the many different terrains they would encounter and next they traversed over some hills and their ingenuity will astound you. So, let’s see some scenery as long as you are careful to not accept any rides from strangers or stop in the wrong places. First look at the St. John’s Bridge really breath taking and next page 43 is magnificent the Mulnomah Falls and on pages 44-45 these are breath taking The Columbia River Gorge from Chanticleer Point on page 44 and 45 Mount Hood. Well, bikes can have vender benders but or get stuck in the mud hear Debbie’s voice when she surprises Tim. After the desert they went to a camping site and that’s when things heated up for the newlyweds but that you will have to learn for yourself as they both had to deal with rattlesnakes, close quarters and tempers that needed to be tempered you might say. The lessons that young couples will come away with are invaluable as Tim shares their pre-marital counseling, what they learned and areas they would excel at. Read pages 54-55 to learn more. You cannot ever hide from your problems or life so Tim explains that his former boss required that he have an exit interview and that process and more is explained in Chapter 5. But, visiting the desert and seeing the pictures on pages 60 and 61 will sooth anyone’s nerves and more. The incredible sunset on page 65 is amazing. No one ever has smooth sailing or in this case smooth biking as you will learn in the chapter titled Facing our Fears. Despite what they relate the pictures are breathtaking and if you have never been to Idaho you just might take a plane or bike ride after you see these glorious photos. Check out the photo of Roger’s Pass this picture is so beautiful and the greenery so vivid you would think you were there. A visit to the Fairview Baptist Church would renew their spirit and drive and then some physical issues come up but these two would never let that get them down. 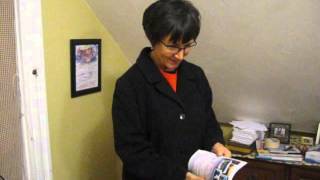 Contact with old friends, meeting a nurse practitioner Debbie shares how God delivered her from her own personal problems. We Can Do This tells the rest followed by Tornado Alley which is Chapter 8. Urban Travel is interesting and Debbie’s description and Tim’s bravery killing a strange bug brings some humor into this story. The pictures, the places the events and the people along the way bring this trip to life for everyone riding along with both Tim and Debbie. The interesting comments made by each author helps you see the trip through their eyes. The last wing of the trip was through the Adirondacks where they encountered another flat tire. The most beautiful photo is on page 166. You want to know what it is you have to read the book and find out for yourself. As we visually see Debbie biking every step of the way she braves it at the end when she comes face to face with the most adorable deer. The final leg of the journey, the funny things that happened, the fact that they were brilliant at finding rest stops you can read, visualize and hear their thoughts in the chapter titled Homestretch. “We experienced a precious simplicity to life on the road.” This says it all. Tim further explains their plan for a great “life system,” and many years of realizing that Two Are Better. I find it simply amazing when two people join hands at any stage of life and set out to see the world. Older couples certainly have less to be concerned about! The sights we see and the places we are taken to are breathtaking! The pictures add dimension to their stories as we bicycle coast to coast with them. I asked myself, where would I go and what would I take? What would my lists look like if I were able to go anywhere in this beautiful country of ours? When you read this book imagine your I find it simply amazing when two people join hands at any stage of life and set out to see the world. Older couples certainly have less to be concerned about! The sights we see and the places we are taken to are breathtaking! The pictures add dimension to their stories as we bicycle coast to coast with them. I asked myself, where would I go and what would I take? What would my lists look like if I were able to go anywhere in this beautiful country of ours? When you read this book imagine your own journey. I received a free copy of this book from a Goodreads contest. I love reading travel memoirs using all modes of transportation. I've read quite a few bicycle travel memoirs. What I liked about this one were the color photos throughout the whole book. You rarely see that so the layout was well done. The story was a little bland to me but interesting enough to keep me reading until the end. I wish this couple all the best in their life together. Thank you Goodreads for the Kindle edition of this book. Enjoyed reading about Tim and Debbie's budding romance, marriage and coast to coast bicycle adventure at the age of 52. He was more cautious and she was more daring which seemed to compliment each other. I won this book in a Goodreads giveaway. It was a little hard to believe that so many changes happened in such a short time. Not a book that I would recommend, however I wish them both every happiness. Inspiring book about a cross-country trip on bicycle. I liked it. I won this in a GOODREADS giveaway. Colorful photos with a great presentation make this a very pleasurable read. Thanks for sharing this part of your life with me. Disclosure- Authors Tim and Debbie Bishop kindly sent me a copy of "Two Are Better: Midlife Newlyweds Bicycle Coast to Coast" to review after reading my review of one man's healing walk along the Appalacian Trail after the death of his wife. Six weeks after I was married (and before my wife was bold enough or smart enough to say no) we loaded two mountain bikes with panniers, slick tires, sleeping bags, a tent, Military MRE's, a small stove and boarded the Ferry in Puget Sound headed toward Nesko Disclosure- Authors Tim and Debbie Bishop kindly sent me a copy of "Two Are Better: Midlife Newlyweds Bicycle Coast to Coast" to review after reading my review of one man's healing walk along the Appalacian Trail after the death of his wife. Six weeks after I was married (and before my wife was bold enough or smart enough to say no) we loaded two mountain bikes with panniers, slick tires, sleeping bags, a tent, Military MRE's, a small stove and boarded the Ferry in Puget Sound headed toward Neskowin, Oregon. We were young, in love, and naive and woefully underprepared. Our bikes were poorly balanced (all the weight resting the rear rack) causing the bikes to shake going downhill and perform unwanted wheelies. We had car maps with no elevation or gradient or accurate mileage markers. We road busy back roads with no shoulder often over 60 miles per day (too much for loaded bikes). We camped in biker/hiker sites, dodged dead seagulls across the 1 mile astoria bridge, and rode through a foggy tunnel near Sea Side praying an RV wouldn't mow us down. We developed saddle sores, ran out of water in Washington and stopped at a Bar to fill our watter-bottles, and had a beer can thrown at us out of pick-up truck. Yet we were successful and cruised down highway 101... 300 miles to the south--very proud of our accomplishment. Tim (a corporate man-engineering mindset) and Debbie (a teacher) endured years of self described loneliness as they prayed for a mate. As so it happens they met in Cyberspace in their 50's and were married. 11 days after their wedding Tim & Debbie embarked on a transcontinental unsupported bike ride from Seaside, Oregon to Cape Elizabeth, Maine. Their grand bike-ride uproots common themes in travel biking adventure: overcoming adversity, finding unity, consuming more calories than imaginable, pride in accomplishing goals, humor about body hygeine, arguments, trust in the common people of America who helped them along the way, living better on less (just your bike and its gear, faith in God, and a winsome relection when their trip was complete. The book is written in a travel blog style: Tim's words are in black and Debbie's words are in pink. Interspersed in the book are pictures of their ride, including a picture of a fawn and Debbie (entitled my Dear and a Deer..newlywed bliss)! From a cycling perspective I appreciated their recount of cycling through Portland, Oregon, Multnomah Falls, and up the Columbia George (all areas I am familiar with). I also appreciated their attention to details and the end of the book recaps their daily mileage, speed, and elevation gain with engineering precision. A purist might diminish Tim and Debbie's accomplishment as they skipped a few miles in the Midwest (caught a ride with a friend) as Debbie was needing to get back to her teaching job. From a marital perspective they were quite frank with their frequent arguments. - "I could have wrapped that blown tube around his neck!" - "I quietly considered flying home from the next airport." - "Then after we couldn't even see the edge...our headlamps were useless, but Tim wouldn't stop." I could relate to many of these arguments. I pushed my wife further than was comfortable. My advice would be 1)learn how to change a flat tire (it's not as easy as you think when it happens on the open road) and forget about the patches--just bring a spare tube (they only cost a few dollars). 2) If you are fully loaded--dump out 33% of your gear and plan on riding only about 50-60 miles per day. Fully loaded bikes may only average 10 miles per hour. 3) Find good maps that put you on rails to trails, less traveled roads, and roads with wide shoulders. Tim and Debbie get stronger as their ride crosses the Rocky Mountains and into the winds of the midwest and through the cities of the NE (Cleveland). They never quite make a century in a day(98 miles in Maryland) but they keep moving with very few rest days. They relied heavily on their Christian faith to keep them going. 4 stars to the Bishops...they got busy living! "We survived, in fact thrived...without the morning paper, yard work, tv talk shows, mainucures, counselors..these things are not wrong, just not important in the grand scheme. Undistracted, we were free to enjoy God's creation." Waiting upon the Lord takes on new meaning when you’ve been searching for companionship for over thirty years. But when you wait for God’s timing, He doesn’t disappoint. His redemptive grace translates into second chances, a fresh start, and the overwhelming joy of a long-standing prayer answered. Such was the case for Tim and Debbie Bishop. At age 52, the couple finally found in each other that special someone they’d been searching for years to marry. They moved from marriage proposal and wedding, to Tim’s “retirement” and relocation, to embarking on their cycling adventure in only ten weeks. There was no more need to hold back once God gave the green light. Two Are Better shares the joy and excitement of the Bishops’ escape into togetherness. From Tim’s epiphany about his stale life to Debbie’s dramatic spiritual conversion and deliverance from addictions, God leads them in some fascinating ways. When midlife crisis threatens to spoil the party, God transforms it into a midlife miracle, with an ensuing celebration to match. The bicycle tour doubles as a classroom filled with metaphors that reinforce the spiritual truths and lessons of a larger journey through life. Fear and faith wage war throughout, and other spiritual concepts rise to a practical level. The Bishops were awestruck by the beauty and bounty of America. They brought back some pictures to share with you. Over 100 color photos supplement vivid descriptions of their magnificent surroundings. Their dual (and sometimes duel) narrative challenges readers to pursue their own dreams and to find their own release from the humdrum that life at any age can bring. Their inspirational story is a strong reminder that God wants to grant us the desires of our heart in His perfect timing. And when He does, you will never be the same. TWO ARE BETTER is marketed as Travel/Adventure, and while it is, in some ways, it is more the story of Mr. and Mrs. Bishop’s discovery of each other, their beginning relationship, and their relationship after they married. I discovered that neither was very well prepared for a bicycle trip across country (for example, they didn’t know how to patch an intertube). I am happy they found love at fifty and were in good enough shape to mostly bicycle across the country (they did hitch some rides, most of the way through Minnesota, for instance) and they survived the trip to write about it. Tim was mostly the writer of this book. They designated authors by color, Tim had black, Debbie had magenta, which is a really unique idea. The few bright patches of pink stood out. If you are looking for a memoir about Mr. and Mrs. Bishop’s relationship and road trip, this is the book for you. If you are looking for more travel/adventure you can do better. 4 stars for an interesting story. $19.95. 208 pages. Two Are Better has been a rather enjoyable read. Authors Tim & Debbie Bishop have done a fantastic job with their first book which chronicles their life together and their audacious journey across the continental United States. Their story is encouraging and engaging; their testimony of Christian faith and character is uplifting. The book is well-written and worth a look for any casual reader! 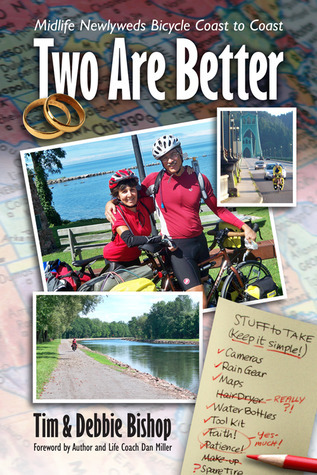 Disclaimer: I received a free copy of Two Are Better: Midlife Newlyweds Bicycle Coast to Coast from Two Are Better has been a rather enjoyable read. Authors Tim & Debbie Bishop have done a fantastic job with their first book which chronicles their life together and their audacious journey across the continental United States. Their story is encouraging and engaging; their testimony of Christian faith and character is uplifting. The book is well-written and worth a look for any casual reader! Two Are Better is a wonderfully told story of Tim and Debbie’s adventure- both as cross country cyclists as well as a newly married couple! I don’t read many non-fiction books- I admit, I’m more of a fiction gal, however, after reading Two Are Better, I just may make a change. There are many aspects of their book that I really enjoyed- from the beautiful photos to how Debbie would interject her own observations and thoughts providing a multi-dimensional perspective on life, marriage, and cross c Two Are Better is a wonderfully told story of Tim and Debbie’s adventure- both as cross country cyclists as well as a newly married couple! I don’t read many non-fiction books- I admit, I’m more of a fiction gal, however, after reading Two Are Better, I just may make a change. There are many aspects of their book that I really enjoyed- from the beautiful photos to how Debbie would interject her own observations and thoughts providing a multi-dimensional perspective on life, marriage, and cross country cycling. The book itself is very uplifting and inspirational. Tim begins by giving a bit of background on himself and what leads up to he and Debbie’s marriage and ultimately their decision to embark on a daring honeymoon trek across the United States by bicycle. The payout of this book as a reader is two-fold. First, it is a great travelogue of a journey across the country. As an avid traveler and someone who has driven across most of the United States I was intrigued by the route and the scenery that Tim and Debbie took on their journey. I loved Tim’s vivid descriptions of the different regions and states. It was interesting to think about a familiar location – say Montana- and see it in terms of the challenges it would present to someone who is traveling outside the norm of a motorized vehicle. Dangerous inclines, declines, curves, crazy dogs and wildlife are all things you have to consider when on bicycle, not to mention strange men in vans in the middle of nowhere. I cringed with sympathy pains when Tim and Debbie talked about the ‘saddle sores’ from long distance riding. Overall, it was an exciting journey to read and really ‘see’ through their eyes. The second payout comes in the form of a wonderful inside view into the trials and celebrations of a new marriage. I loved watching the evolution of their relationship bloom. From cycling buddies to life partners, they are a great team. The strengths that each bring to their marriage are very apparent by the end of the book. Tim is very cautious and keeps things ‘real’ and make sure to weigh the pros and cons of the situation. Debbie is the free spirit- she is ready to jump in and then ask questions or figure things out as needed. There is one part of the book that truly illustrates these traits. They are riding down out of the hills and it is getting dark. Tim, being cautious, takes his time and uses his brakes- always aware to the possibility that something unexpected, like a deer, might pop up and cause injury. Debbie, on the other hand, lets it all go and enjoys the rush of racing down the hills and (at least to Tim) doesn't worry about the ‘what if’s’. Romantic spirit that I am, I loved this journey of two people who find each other and through triumphs, time, and divine inspiration are able to become each other’s perfect match. Their story is a true testament to my own personal faith that God indeed does have a plan for each of us and that if we open our minds and hearts we will be shown the way. Newlyweds Tim and Debbie Bishop not only had a honeymoon, they had an adventure of a lifetime. Each had waited over 40 years to find the right partner, a godly person with shared values and passion for life, and then another 10 to decide the time was right to make a commitment to each other. But once they did, they attacked their life together with gusto. They decided to spend two months riding bicycles from the Pacific Ocean to the Atlantic via Adventure Cycling Association’s Northern Tier rout Newlyweds Tim and Debbie Bishop not only had a honeymoon, they had an adventure of a lifetime. Each had waited over 40 years to find the right partner, a godly person with shared values and passion for life, and then another 10 to decide the time was right to make a commitment to each other. But once they did, they attacked their life together with gusto. They decided to spend two months riding bicycles from the Pacific Ocean to the Atlantic via Adventure Cycling Association’s Northern Tier route (with a few variations). Two are Better – Midlife Newlyweds Bicycle Coast to Coast is on the surface the story of the Bishop’s trek across America, but it is really much more. It is the tale of how they met, became friends, and fell in love. It is a testament to their faith in God and His importance in their lives. And it is a message of hope to everyone who is waiting… and waiting… to find that perfect someone. The book is organized, as many travelogues are, with each chapter covering a section of their journey, first in their relationship and then their time on the road. Tim Bishop is the primary author and the story is told principally from his point of view. Every once in a while, however, Debbie Bishop chimes in with her perspective; her first-person text is set apart by being printed in magenta. While it was interesting to get Debbie’s thoughts, I found myself wishing that either more of her words had been included or none at all. Seldom did Debbie’s paragraphs add anything essential to the story, and often they interrupted the flow of Tim’s account. I think they could have found a way to write the story together which would have balanced both perspectives and been easier to read. Running parallel to the travel story is the story of the Bishops’ constant faith in God. They each discuss how they came to find God, and the importance of their faith in their lives. Scarcely a page goes by without a reference to prayers, devotionals, gratitude, or the “powerful reminders of God’s presence in our lives and His blessing on our trip.” They discuss frequently their work with TheHopeLine, a nonprofit Christian organization dedicated to helping troubled youth. The Bishops’ dedicated their ride to TheHopeLine, and spread the word about it everywhere they went. Tim Bishop’s clear, unpretentious writing style is beautifully accompanied by hundreds of full-color photographs. It’s a rare two-page spread that isn’t complemented by at least one photo of the area they’re riding through. While certainly not a guide to riding the Northern Tier, Two are Better paints a lovely picture of what riding the route is like, from the countryside to the people to the joys and complications. My s.o. biked across the U.S. with a friend a few years ago -- east to west -- and tells many of the same stories that these authors do: gorgeous, but sometimes monotonous, scenery. Blistering heat. Rain. Frightening traffic. The kindness of strangers. The authors were, as per the subtitle, fifty-something newlyweds when they set out to cross the country on two (well, four) wheels. This was their honeymoon -- challenge hastily planned but wholeheartedly accepted. This is a pure wanderlust envy boo My s.o. biked across the U.S. with a friend a few years ago -- east to west -- and tells many of the same stories that these authors do: gorgeous, but sometimes monotonous, scenery. Blistering heat. Rain. Frightening traffic. The kindness of strangers. Tim does the bulk of the storytelling, with Debbie chiming in occasionally. Both write plainly, though with competence; I would have loved to see more from Debbie (especially in terms of her pre-Tim life), but my impression is of a collaborative effort. There's a wonderful trip log at the end of the book, so you can see how far they biked each day, where they stayed, speed, elevation, etc. I'm not one much for bikes (didn't learn to ride until I was more or less an adult; I can do so now, but it's best if I can just go straight. On level surfaces. And never have to stop or turn or anything like that. ), but gosh. Adventure! Recommends it for: People who enjoy blogs of adventures and bicycling or cross-country travels. This book makes you think about your dreams and priorities in life. Is it time to get out of the rut and pursue something different? What is your focus and how can you pursue life in a balanced and healthy way? What does that look like for you? While Tim & Debbie focus on telling the story of their bicycle cross-country trip, they also share the life lessons they learned during preparation for and fulfillment of their dream. They are real people who share their vulnerabilities and mistakes a This book makes you think about your dreams and priorities in life. Is it time to get out of the rut and pursue something different? What is your focus and how can you pursue life in a balanced and healthy way? What does that look like for you? While Tim & Debbie focus on telling the story of their bicycle cross-country trip, they also share the life lessons they learned during preparation for and fulfillment of their dream. They are real people who share their vulnerabilities and mistakes as well as their hopes and passions in life. Their belief and trust in God is a large part of their lives, but it does not come across as preachy, rather, as a genuine and real aspect of how they proceed in life. The story feels a bit like a cross between a blog and a person sitting across the room telling you the story. The photographs in the book are beautiful and really add to the telling of the story. I am not a fan of the magenta ink (that indicates it is Debbie who is writing). It is a little harder on the eyes, so I would prefer black ink with some other way of indicating a change in the storyteller. Those who enjoy blogs of adventures and are interested in bicycling or cross-country travels will likely enjoy the style of this book. -	it is not a book that I feel is a “must read” for the genre. The messages about the bigger picture in life were great and important, however if bicycling or traveling is not your thing, you can probably find other books that are more of your interest that have similar messages about life. First of all, let it be known that I am not a cycling fan, and outdoorsman, or anything else like that. But this story was absolutely riveting, inspiring, and absolutely delightful! It is much more than a cycling chronicle. This is a book that will remind you that when the opportunity comes to try something, don't let it pass you by--do it now! You are not promised tomorrow after all. I was completely blown away when the Tim and Debbie began the book by saying that they got married for the first First of all, let it be known that I am not a cycling fan, and outdoorsman, or anything else like that. But this story was absolutely riveting, inspiring, and absolutely delightful! It is much more than a cycling chronicle. This is a book that will remind you that when the opportunity comes to try something, don't let it pass you by--do it now! You are not promised tomorrow after all. I was completely blown away when the Tim and Debbie began the book by saying that they got married for the first (and only) time at the age of 52! Okay, when was the last time you heard that? They didn't live with a load of people. No, they waited for God's timing to bring them the one. They shared some about their courtship and spiritual life, but the main crux of the story is this (insane) cycling trip! I was never bored as I read their story, and it was even better that maps, pictures, and anecdotes were shared from the trip. I can't imagine doing this trip at any age, but at the age of 52 as a part of an extended honeymoon? Wow! Every Sunday, they went to church, and God continued to bring along little and big miracles along the way. The book is primarily told from Tim's point of view, but Debbie's thoughts are sprinkled throughout the narrative. I was reminded of God's providence, love, and provision, and I marveled at how well-suited these two were. I highly recommend this book! Two are better contains two remarkable stories. In the first part you'll meet Tim and Debbie Bishop, both having a active social life, trust in God, work and cycling as hobby, but without a spouse until they met each other in their early fifties. In only 10 weeks, they moved from marriage proposal and wedding, to Tim's retirement and relocation, to embarking on a cycling adventure of a lifetime. Enter part two: a tour from the Pacific Ocean in Oregon, Portland all the way to toe tipping the Atlan Two are better contains two remarkable stories. In the first part you'll meet Tim and Debbie Bishop, both having a active social life, trust in God, work and cycling as hobby, but without a spouse until they met each other in their early fifties. In only 10 weeks, they moved from marriage proposal and wedding, to Tim's retirement and relocation, to embarking on a cycling adventure of a lifetime. Enter part two: a tour from the Pacific Ocean in Oregon, Portland all the way to toe tipping the Atlantic Ocean.53 riding days, 15 states and Canada, 3.529 miles, 67 miles per day, and 100,003 feet of elevation. Struggles with their bikes, the weather, sore butts, intense heat and steep ups and downs in both the Rockies and the Appalachians. Blue and dark skies, Tornado Alley, Adventure Cycling Maps and a constant rescheduling of the days ahead. Will a summer break be long enough to end up at the East Coast? Both Tim and Debbie wrote parts of their stories, both the adventurous side, awkward moments and sharing from past addictions which are overcome. As newlyweds they had a wonderful opportunity to learn to know each other in good and bad times. Despite warnings upfront their marriage came out stronger after crossing the US on their bicycles. Different landscapes in the various states are painted with words, and illustrated with pictures taken along their ride of a lifetime. Two Are Better is a book that holds wide appeal. Cyclists and travelers will enjoy Tim's attention to detail as he shares their coast-to-coast journey: the technical stuff, like how he chartered their course, daily mileage, repairs along the road, and the difficulty of embarking upon such a journey without proper training, and also the beautiful descriptions of the areas he paints for the reader along the way that are accompanied by numerous color photographs. Singles and couples will be inspire Two Are Better is a book that holds wide appeal. Cyclists and travelers will enjoy Tim's attention to detail as he shares their coast-to-coast journey: the technical stuff, like how he chartered their course, daily mileage, repairs along the road, and the difficulty of embarking upon such a journey without proper training, and also the beautiful descriptions of the areas he paints for the reader along the way that are accompanied by numerous color photographs. Singles and couples will be inspired by how these two people were brought together by God and the many tiny miracles along their journey as they learned a great deal about themselves and each other. Intermingled with Tim's narrative is Debbie's point of view on certain aspects of their lives before and during the trip, in addition to her thoughts on that final night before arriving in Maine. While not someone who is interested in cycling, that didn't keep me from thoroughly enjoying Two Are Better. Tim speaks with an air of authority tempered by a deep love for life and Debbie has an adventurous heart. The numerous photographs and this couple's ability to share so much of themselves make this book a truly special reading experience. You simply can't help but get caught up in their story. I feel as if I've journeyed the country right alongside them and been treated to many sites I might not visit on my own. What a blessing. What an exciting adventure......marriage for the first time at age 51 for Tim and for Debbie and then to bicycle from the west coast to the east coast for their honeymoon. I read this book in one afternoon and was constantly showing my husband pictures from the book and reading portions of the book to him. I have always thought it would be fun to give up our jobs and home and live in a camper, but bicycling is an extreme undertaking. Tim and Debbie described scenery so well that I felt like I wa What an exciting adventure......marriage for the first time at age 51 for Tim and for Debbie and then to bicycle from the west coast to the east coast for their honeymoon. I read this book in one afternoon and was constantly showing my husband pictures from the book and reading portions of the book to him. I have always thought it would be fun to give up our jobs and home and live in a camper, but bicycling is an extreme undertaking. Tim and Debbie described scenery so well that I felt like I was traveling right along side them. I shared in their joys and pains and appreciate the way they found a stop near a church each week. Enjoy the thrill of the ride with Tim and Debbie Bishop! At age 52, Tim Bishop left a successful career as a corporate treasurer, married his dream girl, and embarked with her to parts unknown—on bicycles! Tim and Debbie have since coauthored four books about their midlife bicycling adventures. Publishers Weekly dubbed their latest, Wheels of Wisdom, “a roadmap for life.” In addition to their coaching experience on TheHopeLine, The Bishops bring a stron At age 52, Tim Bishop left a successful career as a corporate treasurer, married his dream girl, and embarked with her to parts unknown—on bicycles! Tim and Debbie have since coauthored four books about their midlife bicycling adventures. Publishers Weekly dubbed their latest, Wheels of Wisdom, “a roadmap for life.” In addition to their coaching experience on TheHopeLine, The Bishops bring a strong Christian foundation to their inspirational, self-help books. Tim is a three-time Maine chess champion, a CPA, and a consultant for small businesses. He has also written a business book, Hedging Commodity Price Risk. He is still out to prove that the writing contest he won as a college freshman was not a fluke. The Bishops blog at OpenRoadPress.com.